The guy with the open shirt would make a nice Adam Kismet from 7TV. Meh. Im not so sure. What game would you actually play with these? Pulp Alley? Crooked Dice's 7TV rules? Larger Than Life: Director's Cut are my go to pulp choice. These are great. Any game with armed modern civilians! Right there with ya. I saw those and immediately thought of the old Sprechenhaltestelle module. For rules, almost any "pulp"-y could work, especially if designed for very low numbers of miniatures. In addition to the stuff already mentioned, I'd add .45 Adventures ( Rattrap Games), Astounding Tales! 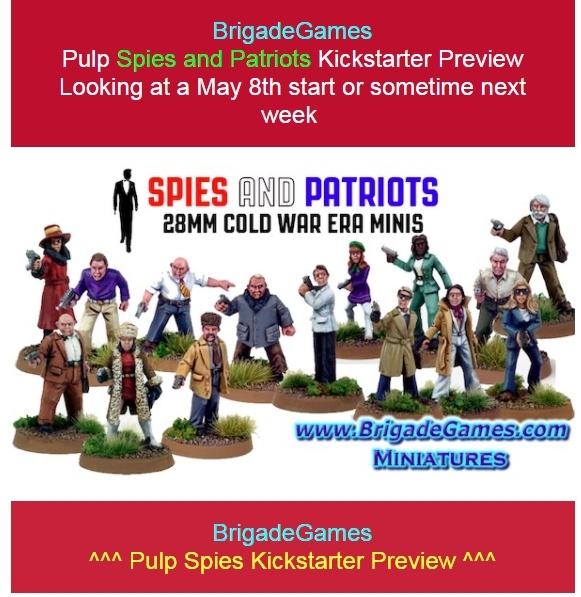 ( Howard Whitehouse), Savage Worlds Showdown ( free minis rules by Pinnacle), or almost anything by Ganesha Games tweaked to be SpyFi, or even a modernized tweak of one of the GASLIGHT variants. Spy Fi minis gaming strikes me as the kind of thing where you either go RP-ish or alternately, do a big, multi faction, crazy, convention game, kinda Braunstein style. I can't see much in between working well. They don't have to be just spies (although that's a perfectly fine start). What game would you actually play with these? All of the above, even Full Metal Anorak. Some of the slightly frumpier minis would work for Ash vs. Evil Dead. Could use more miniskirts for 7TV! Funded and headed towards stretch goals. That's great news. Hopefully, we'll see the second Russian sparrows unlock – there's an excellent "Nuclear Blond" in that mix. We made great progress yesterday. Thanks for that. We are $900 USD from Unlocking the Soviet Agents IV – the second Red Sparrows pack. Please share the KS link far and wide. The baldish guy looks like Ed Asner. I am glad to see evil villains are included in the set.